Posted byozgurnevres	 August 12, 2015 December 11, 2015 Leave a comment on Are laser pointers good toys for cats? The overall answer is: sometimes, under some circumstances. And you have to use it very carefully and responsibly. Playing is very important: first of all, kittens learn chasing, hunting and problem-solving skills, and these skills may be very crucial in their future life. Adult cats train and sharpen their predatory abilities. It is also mentally stimulating. Play teaches cats bite inhibition and helps them develop agility and coordination. They learn boundaries and social skills while building relationships. It is also very important to develop their muscles and keeps them fit. Play also helps shy kittens build self-confidence. If your cat isn’t playing with physical toys, lying around all day and gaining unnecessary weight, the laser pointer may be an ideal tool for you. With that little red dot, you can unleash the hunter inside your cat. Or if you’re working in a place where some cats around, like me, and if no cat toys available to use, you can entertain them with it. 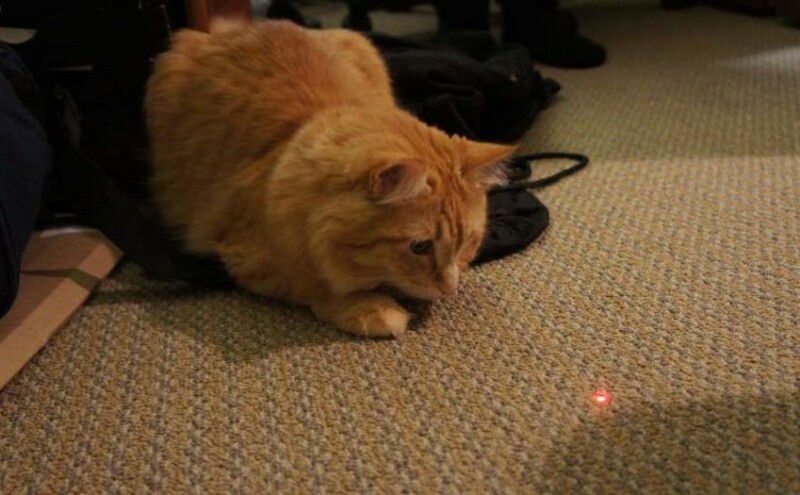 Playing with your cat with a laser pointer is easy, all you have to do that just turning on the device and moving the dot around. But keep in mind, laser toys can frustrate cats because it is an unbeatable foe, there is no actual prey after all that hard work for her/him. Even in some cases, they cause them to act aggressively toward playmates. Felines need to have the satisfaction of the hunt, to catch and feel their prey beneath their paws. Because of that, give them a real toy after playing with the laser, at least sometimes. Another possible use of the laser pointer is against the bully cat. If you have more than one cats, and one of them is bullying the others, you can use the tool when the bully cat preparing to launch an assault. With giving her/him a much more attractive “victim”, you can distract her/him with a better way than yelling or screaming to prevent the cat fight. Are laser pointers safe for their eyes? If aimed at a person’s eyes, laser pointers can cause temporary disturbances to vision. There is some evidence of rare minor permanent harm, but low-powered laser pointers are not seriously hazardous to health. Most commercial laser pointers available are low-powered and pose little risk. But since cat’s eyes are more sensitive to light than ours, this would still leave quite a margin of safety. Some say there is even a small chance of lasers can damage the sensitive retina and cause blindness. So, it would be better not to point them to their eyes directly. So, if you really have to, use the laser pointer, but there are lots of better alternatives, like small soft sponge balls. See my dear Lotto, while she is playing a sponge ball.